A garden bird list is a reasonable antidote to those days when you are stuck indoors or have to work at home. My rules are simple. I have 2 categories: landed in garden or flyover. If I can see or hear it from the house or garden, it’s on the list. Over the past three winters, I have been nurturing an ever increasing flock of Redpolls, focused around a couple of nyger seed feeders. They twitter away all day long outside the window. At peak, 35-40 are around at once. As usual, there is an interesting array of plumage variation. 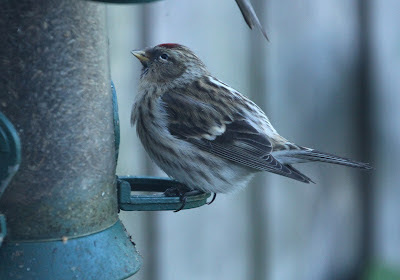 Most, of course, are Lesser Redpolls, but if you take the following to be characteristics of Mealy Redpoll: grey-brown upperparts, greyer head with whitish nape collar and ‘bulging’ neck, strong white wingbars, a pale streaked rump on a white background which bleeds white into the surrounding flanks and lower back, whitish underparts and undertail coverts (some with arrow-shaped dark centres) and a long primary projection, then I have a few that fit the bill. Unfortunately, my garden is rather dull. Redpolls are by far the commonest bird. However, if I lean out of the upstairs window on one leg and view sideways between two distant houses, I can see a sliver of the village pond. Recently, I noticed an Egyptian Goose on the pond as I drove home. A skid onto the drive and a quick run upstairs, followed by nearly one hour on one leg peering sideways and it swam across the sliver of view. Result. The problem is that the occupants of one of the above mentioned houses has an increasingly large Yucca tree growing in the crucial gap and the sliver of view is declining year on year. A midnight raid with a bowsaw has been considered, but the more obvious answer is to move. So sadly, we are leaving our glorious view over Epping Forest in the Land of Spray tan and Bling and heading to pastures new. With this momentous decision made, I got another new garden bird: a Heron came and ate all my frogs. 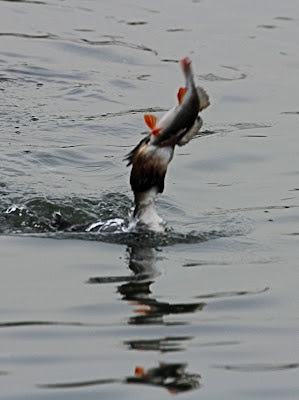 Feeding frenzy - Shufflers, Coot-muggers and a Great Crested Degree. With a few inches of snow and an easterly breeze, I decided it was time to give Siri a go on my up-graded iPhone rather than get frozen fingers scribbling in the notebook. As I wandered around the valley, a summary of each site was carefully dictated before I headed home, hoping to find my day list magically appearing on my computer via iCloud. And there it was. Holyfield Marsh was particularly good. Apparently I saw a lot of Shufflers, 157 apparently. And also 13 Descenders, 350 Tufted Darks, 4 Snooze (3 drunks and a redhead), 15 Great Crested Degrees and a Yellow-laked Goal. I’m not sure whether I need to train Siri better or change my accent. With large numbers of birds restricted to small areas of unfrozen water, the apparent heightened and frenzied feeding activity was interesting. 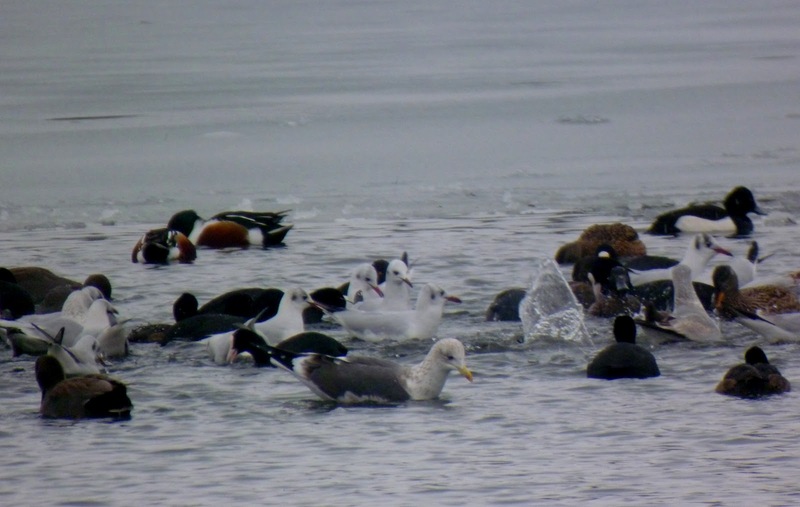 Several groups of diving Coots not only had their associated kleptoparasitic Gadwalls (the ‘Coot-mugger’) but had attracted a range of other ducks and gulls. Nearby, a swirling mass of 60+ Shovelers, sorry Shufflers, continued to stir up and sift planktonic invertebrates from a small patch of water. 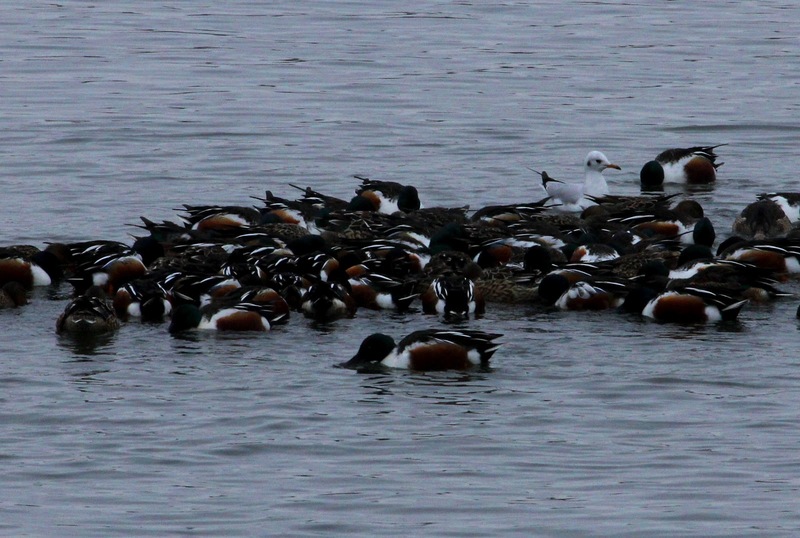 Such feeding behaviour is typical of the Shoveler, but I can’t recall such a large group or such frenzied activity. I had followed almost the same route around the lake back in the freezing conditions of January 1985. 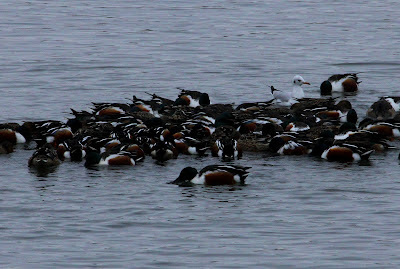 On that visit, the count of Smew reached a remarkable 40 birds (with at least 19 drunks), along with a Slavonian Grebe and 300 Wigeon. A Bean Goose (‘rossicus’ say my notes) had joined the adjacent Canada Goose flock but it eventually and illogically got dismissed as an escape. I think even Siri would have got that right. 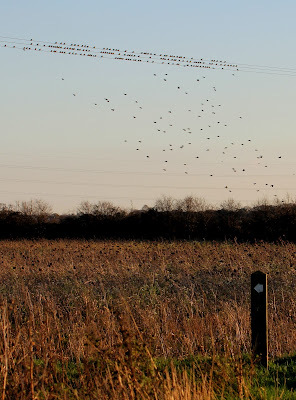 Another trip down to Wallasea at the weekend was enlivened by a spell of watching over the area sown with ‘wild bird cover crops’, which has been attracting large numbers of birds. The influx of Short-eared owls and other raptors this winter has brought into focus, at least for me, the value of these areas for farmland birds. At Wallasea, 15 ha has been sown with wild bird cover crops, split between spring sown, autumn sown and fallow plots, which are rotated. The spring mix, re-sown annually, contains 30% barley, 25% spring wheat, 20% millet, 20% triticale (a hybrid of wheat and rye) and 5% mustard. This plot was targeted at Corn Buntings and this winter has attracted over 300, as well as 120+ Linnet, 150 Skylark and 70 Reed Buntings. Raptors regularly seen around the plot have included up to 5 Hen Harriers, 5 Short-eared owls, Merlin, Peregrine, Sparrowhawk and Kestrel. My recent trip to Exminster Marshes revealed another good area, with 600+ Linnets (now up to 900 apparently) and a variety of buntings on show. Last winter, during the severe weather, this plot attracted 1200 Skylarks, 800 Bramblings and 500 Chaffinches; not a bad haul. 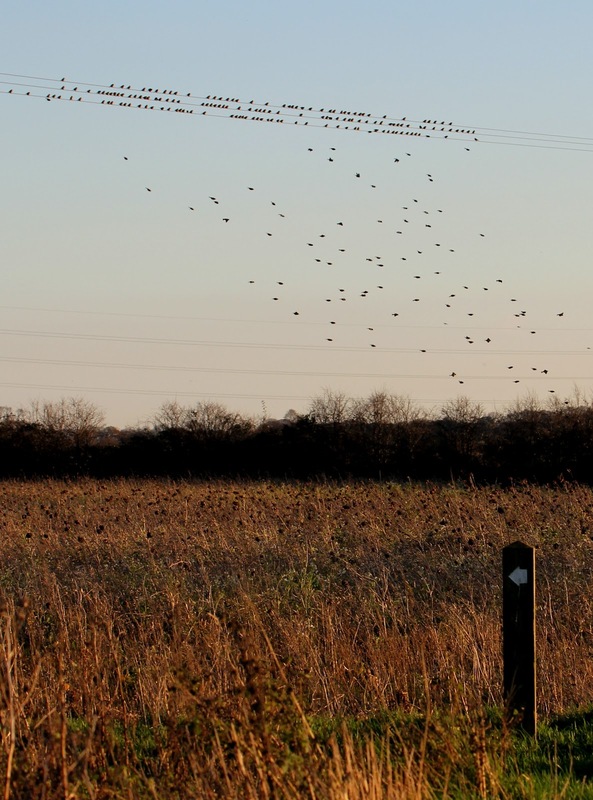 At Greys Farm in north Hertfordshire, extensive areas of wild bird cover have benefited farmland birds, principally in a very successful effort to boost partridge populations, albeit with very intensive predator control. 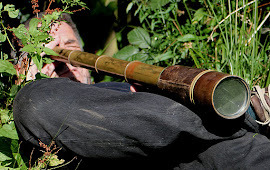 This winter, the farm has provided a focus for raptor watching, with three Hen Harriers, Red Kites, several Short-eared Owls and a Great Grey Shrike.